This is the way the church looked prior to the columbarium in September of 2008. Mural was designed by Father Ricardo Bauza with the help of Derek Rubio and painted in tile by artist Shaan. 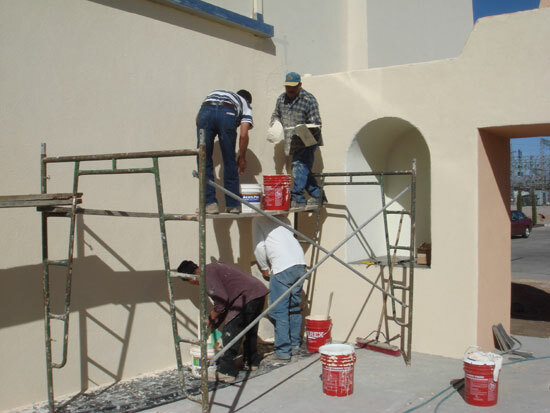 The construction of the columbarium began in October of 2008. The windows of the church being washed and painted for a better appreciation of their beauty. Gilbert Melendrez and Frank Paz help put the mural together. Father Ricardo is showing the statue of the Holy Family designated for the columbarium. Employees of Sandoval Construction working on the columbarium. The mural of the Risen Christ is finished and attached to the wall. The desert landscape at the entrance of the columbarium. The Paz Family were the lucky winners of a new pew. A huge crane is lifting one of the 4 ton units that make up the niches. Danny Montoya was the contractor hired to remodel the sanctuary. The ceiling was raised 3 feet in order to accommodate the old high altar. The decorated tin tile was put on the ceiling of the sanctuary.